'S e fear-gnothaich agus innleachdair às na Stàitean Aonaichte a bh' ann an Steven Paul “Steve” Jobs (24 an Gearran 1955–5 an Dàmhair 2011). 'S e co-stèidhiche, neach-cathrach companaidh Apple a th' ann. B' e Apple CEO, àrd-ghnìomhaiche Pixar Animations a bh' ann cuideachd. Leig Jobs dheth dreuchd CEO aig Apple 24 An Lùnastal 2011 air sgàth gu bheil e a' dèiligeadh le tinneas leantach. 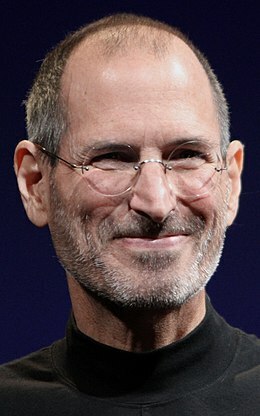 Air a tharraing à "https://gd.wikipedia.org/w/index.php?title=Steve_Jobs&oldid=545707"
Chaidh an duilleag seo a dheasachadh 24 dhen Ghearran 2019 aig 17:11 turas mu dheireadh.